We congratulate Cheryl Duncan, Property Underwriter, for working 25 years at Dumfries Mutual as of September 16, 2018. We’re inspired by Cheryl’s hard work, dedication, and talents that enabled her to reach this milestone. It’s hard to believe that a couple of our staff weren’t born yet when she started here! We recently sat down with Cheryl to learn about her journey and glean from her experience. What led you to your role at Dumfries Mutual? I became aware of this opportunity when I moved to Cambridge from Hamilton. My first interview was on a Wednesday, and I ended up working the very next day. Our Manager, Shelley, had started earlier the same year and I was her first hire. When I joined the team, there were only six staff (including me) and two agents. What habits and traits have helped you succeed as an Underwriter? My ability to prioritize, make decisions, and exercise due diligence has helped me to succeed in this role. It’s important to follow the regular steps to properly assess risks and do my job well. I’ve always tried to collaborate with our Agents and staff in order to best serve our policyholders. We’re a team here – we don’t work in our own bubbles. Did you imagine being here 25 years when you were hired? I’ve always known I wanted to be here as long as the opportunity presented itself. I know I’m fortunate because 25 years is a fairly long time. I enjoy working here. We’re well taken care of and I like the small company feel. I haven’t fallen for believing the grass is greener somewhere else. What are a few of the largest changes you’ve seen during your career? I’ve seen a lot of changes in society, as well as at Dumfries Mutual. We’ve grown and progressed as a company – in size, technology, and product offerings. The most recent change is working in our new office in Sheffield after spending my first 25 years at our old office in Cambridge. What advice do you have for someone considering a career in insurance? I would recommend investing in professional development and growing your insurance industry expertise. A CIP designation can give you a competitive advantage to get hired and advance in the field. You never stop learning and growing if you are willing to work. How do you foresee the future of Dumfries Mutual? I see a positive future for our policyholders and company. Our superior level of customer service puts us head-and-shoulders above large companies (ie: with call centres). While things like technology and products will continue to evolve, you can’t automate quality personal service. And I think that’s something people will always want, especially when they have a question or claim. After graduating from Sir Allan MacNab Secondary School, I decided to work for a year before deciding what to do next. I landed a position at Chedoke-McMaster Hospital, and began working my way up. I was happy there and learned quickly on the job. As such, I never saw the need to go back to school. Did you work at any jobs before Dumfries Mutual? My only other employer was the hospital. I was offered a good job in the Radiology (X-Ray) department after being there for a year. I ended up working at the hospital for 15 years in a variety of positions. Are you originally from Cambridge? I grew up in the west mountain region of the City of Hamilton. My father worked in the steel industry, and my mother at a different hospital from the one where I worked. I could walk to my job at Chedoke-McMaster Hospital. By the way, I also walked to and from our Dumfries Mutual office in Cambridge. That’s 40 years of commuting by foot! What are some of the activities you enjoy outside of work? My husband Rob and I enjoy walking, taking care of our dog, and cheering on the Leafs. I’ve also worked part-time at WW Canada Ltd. (formerly “Weight Watchers”) for the past 15 years. One of my passions is helping people to experience a healthy lifestyle through a proper diet and regular exercise. 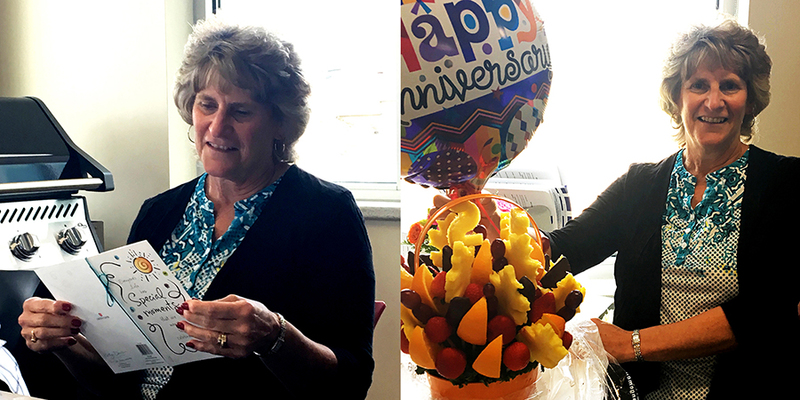 Cheryl was presented with a card and fruit bouquet in celebration of her silver anniversary. Your fuel oil tank matters. Have you compared your insurance rates lately? With Dumfries Mutual, you get competitive home, auto, commercial, and farm insurance rates and great service from your own neighbours. Dumfries Mutual Insurance Company is a residential, auto, farm, and commercial insurance company that serves Cambridge, Kitchener-Waterloo, Guelph, rural Hamilton, and surrounding areas.